The private lives and beliefs of women during the Civil War are not as clear and available to historians as those of men. For the most part, women did not participate in the political arena, they did not march off to war, they did not write letters to the editor of their local newspaper, or write books explicitly detailing their beliefs. To see what women believed, one needs to look at their private letters and diaries, and then extrapolate from their actions what was essential to them. The proper lady of the 1860’s was supposed to be kind, generous to others, and do good works through their home and their church. A woman of this period was constrained not only by society, but also literally by her clothing. 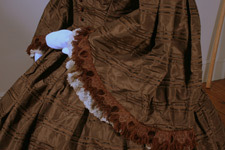 With multiple layers and an understructure supporting the fashionable hoop skirt, a woman had to look for discrete ways to move and influence the world around her. Alma Coe Lyman (1786-1875), described in the Lyman family genealogy as a woman of “strong mind and excellent character,” was a staunch Congregationalist and abolitionist. 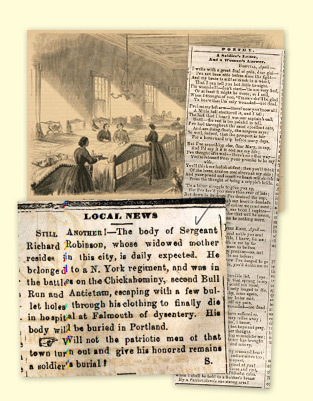 Her husband, William Lyman (1783-1869), had once been set upon by a mob in Durham for his abolitionist beliefs and she was a lifelong subscriber to the American Missionary, a publication that supported eliminating slavery, educating African Americans, racial equality, and Christian values. For Lyman, and others of like mind, the war was not about politics and states rights, but a scourge from God that would cleanse the wickedness of slavery from the nation. When a young man or woman joins the armed services today, they need only show up, everything else will be provided. During the Civil War, almost the exact opposite was true. Many soldiers not only had to provide their own uniform, but also any other comforts or medical supplies they might want or need. The federal government was not prepared to outfit the thousands of men streaming into service, nor to take care of them once they were wounded or killed, nor to notify their families of misfortune. The U.S. Sanitary Commission stepped into this breech. An official agency of the federal government, the Sanitary Commission served as a liaison between the people and the military. The staff and volunteers of the Commission provided uniforms, medical supplies, staffed hospitals, identified the dead, and helped widows and orphans secure pensions. The work of the Sanitary Commission was supported on the local level by hundreds of volunteers in virtually every community across the nation. 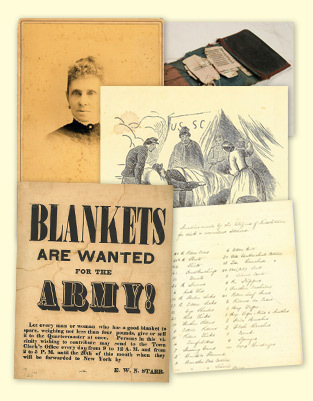 In Middletown, the Ladies Volunteer Aid Society sewed uniforms and other articles of clothing, produced medical supplies, and collected funds which were sent on to the larger organization. In 1864 the organization was able to secure over $1,200 for Sanitary Commission work, a tidy sum that represented an annual middle-class income. 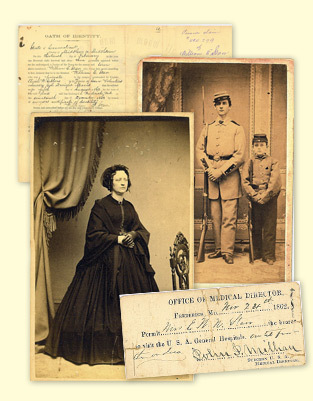 The first president of Middletown’s organization was Adaline Douglas (1821-1885), wife of Benjamin Douglas. She worked tirelessly on behalf of the organization and graciously parleyed her husband’s position and influence into donations of time, money, and labor. During the Civil War, twice as many soldiers died of disease as of battle wounds. Many of the men came from rural areas and suddenly found themselves crowded in with hundreds of other men in conditions that were less than sanitary where they were exposed to diseases to which their bodies had no immunity. Drinking water was not adequately separated from waste disposal, food supplies were limited, and bodies were pushed beyond their limits through marches, exposure, and battle conditions. The military had not made provisions for notifying families when their soldiers fell sick or were wounded in battle. Eventually the U.S. Sanitary Commission stepped into this role and took on the monumental task of notifying people of the dead, wounded, and ill. The Sanitary Commission, and other similar relief agencies, also took on the duty of nursing the wounded and sick. If a family had some means, they would travel to where their loved one was laying ill and nurse him themselves or attempt to bring him home. While his parents were unable to secure him a commission, he was able to serve as a clerk on the officer’s staff, alongside his cousin Edward Brewer. William became ill in the late fall of 1862. His father visited him on November 2, 1862 and wrote home to his wife, “I found Edward better than I feared he might be and in fact his is now doing very well & receives good care & is in an airy location& comfortable…he had been very sick for two or three days…he is not well enough to move.” His mother went down to visit him and by the end of the year had him home on a medical furlough and eventually discharged from the service due to his illness. 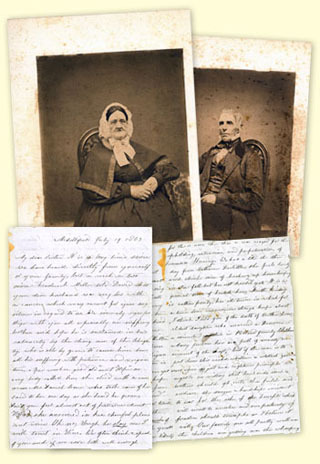 All the carte de visite images appear to have been taken at approximately the same time. It is quite possible that the images of Harriet, William Edward and his younger brothers Henry and Frank, and the portrait of little sister Grace were done so William would have current images of his family to carry with him when he joined the service.